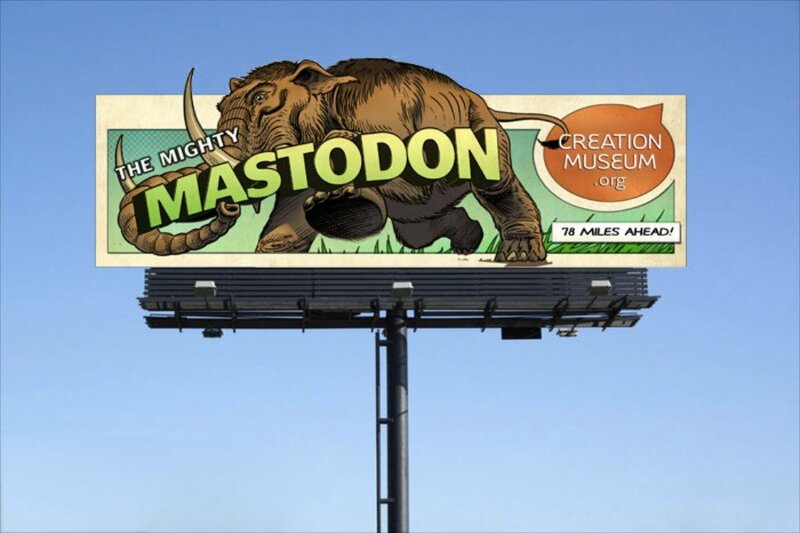 The new Creation Museum billboard campaign has hit the news—and the secularists are worried! 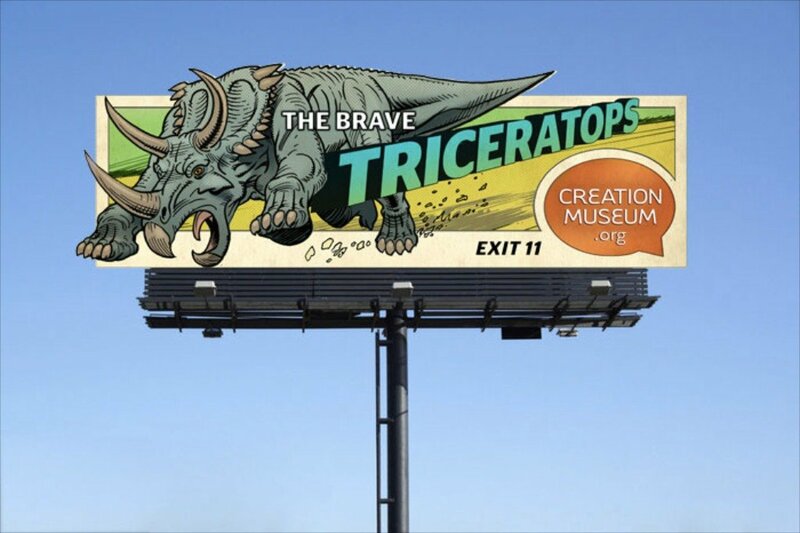 As of writing this blog post, an Associated Press article about our new dinosaur billboards has appeared on many news sites, including ABC News and the Washington Post. The AP article and many blogs indicate that secularists are concerned about them. Isn’t it amazing that they are so worried about one Creation Museum. 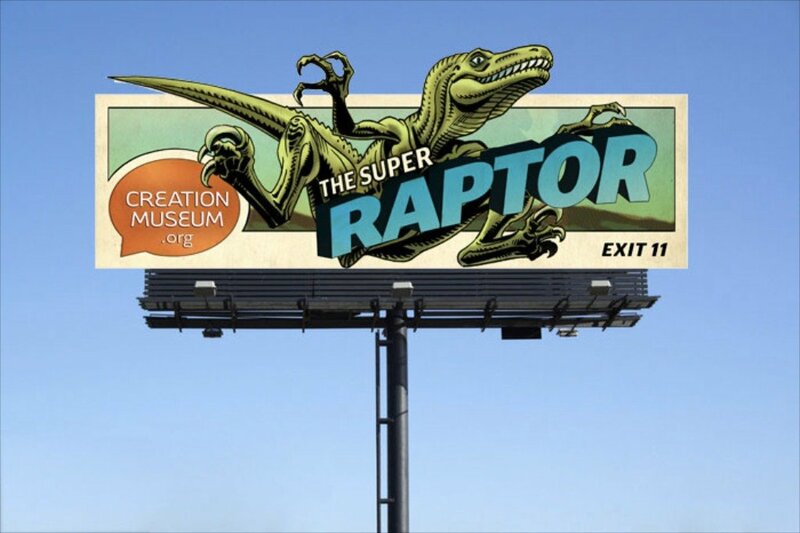 Think of all the hundreds of secular museums and thousands of secular schools, colleges, and universities where evolution and millions of years are taught as fact—and the secularists are really worried AiG’s Creation Museum! That shows how insecure they really are. Secularists just can’t stand it when information they have censored from the public is being disseminated by us. And they don’t want people thinking for themselves; they want them to swallow their anti-God religion! But did you know the secularists have their own billboard campaign going on? And you should see these billboards—talk about attacking and mocking Christianity and grossly misrepresenting what the Bible teaches! 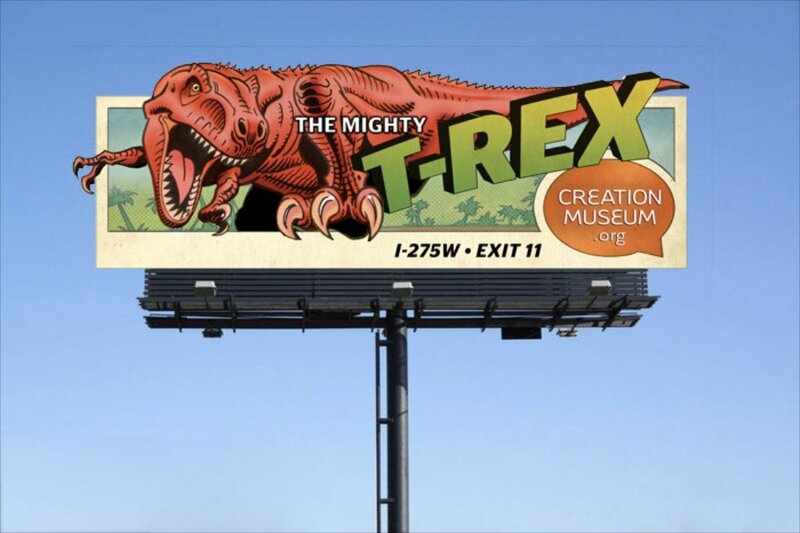 And they complain about our spectacular billboards that just publicize the Creation Museum website. n of history that conflicts with scientific findings. "It's a hook, it's a bait to get people to say, 'Hey let's go to that museum' — and then the other message is brought out," said Steven Newton, a program director at the National Center for Science Education in Oakland, Calif.
Well, that’s no surprise! The NCSE, which is headed up by atheist Eugenie Scott, doesn’t want us advertising a museum that teaches people about the God of creation and the history of the universe in Genesis. And since when have we ever hidden the fact that we teach biblical creation at the Creation Museum? The quote about science educators seems to imply we have a hidden motive! I would think the word Creation in Creation Museum suggests we are not on about evolution! They look better than most of our billboards. Yeah, that's the problem. Heck, I'd like to just see billboards that exciting to children for the Cincinnati Zoo or Museum Center, let alone a decent atheist billboard. 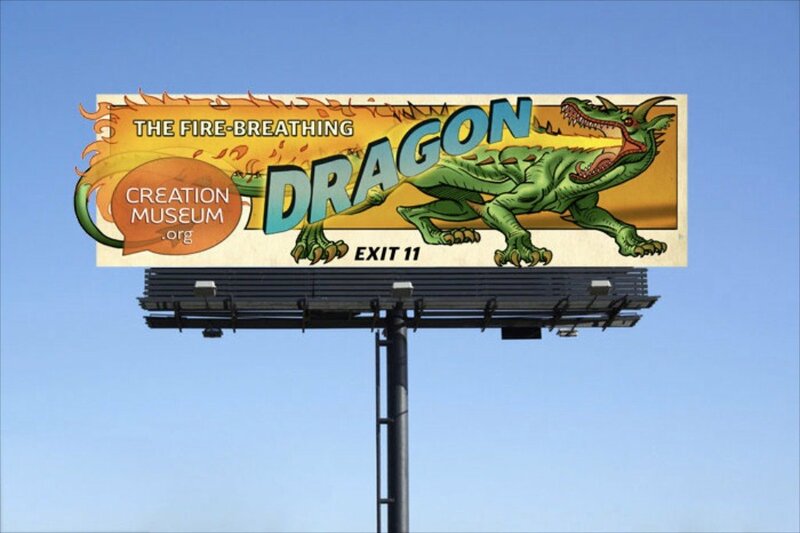 I hate the Creation Museum billboards because they're so [expletive] good. Look at that billboard and imagine you're a little kid just getting excited about the concept of dinosaurs. 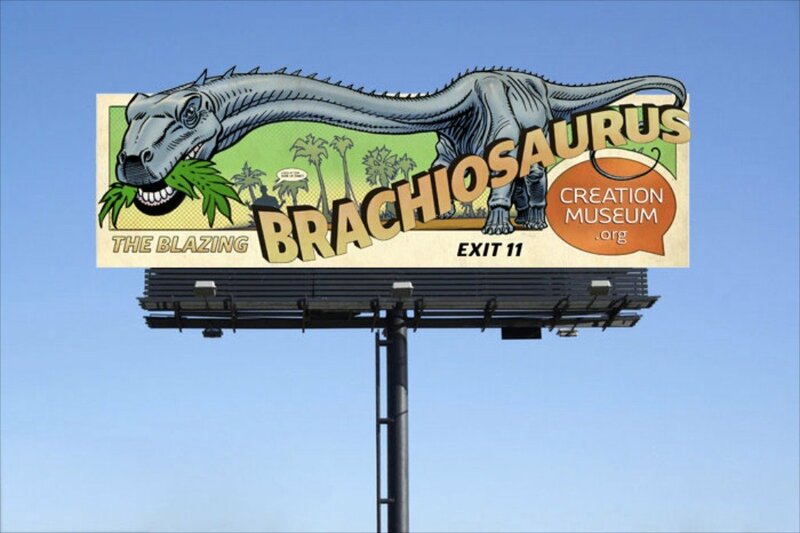 I live near enough to pass their billboards often and I dread the day my kids says: "Can we go there and see the dinosaurs?" Fortunately I already have my answer: "No, but we can go to the zoo and see the Komodo Dragon, or we can go to the Museum Center and see the mammoth skeleton, or we can even go to King's Island and see their dinosaurs, which are a lot bigger and better and have rides nearby." But really, I can see a lot of kids and their parents taken in by this billboard with no idea of the kind of horror show indoctrination center they'll be walking into. Well, acknowledging the superb billboards is a good thing. Secularists are very concerned that children will be influenced by them and want to come to the Creation Museum. They want children to be only indoctrinated in their atheistic evolutionary religion. Newton said science centers should be employing powerful marketing strategies like the Creation Museum's campaign. "I think it's a real shame that there aren't science museums that are competing in the same way, with the same sort of advertising with the same sort of budgets," he said. You mean our government-funded (using our tax money) Smithsonian would not have a marketing budget as big as the marketing budget of the Creation Museum? And what about all the other secular museums (no doubt most are funded by our tax dollars) such as the Chicago Field Museum and New York Natural History Museum—and the many, many others! But what the media is largely not telling you is that the atheists have their own billboard campaign. Have you seen their boards? You need to. And then compare them to the Creation Museum billboards. The atheist billboards mock Christians and the Bible as well as misrepresenting the Bible etc. I urge you to look at this website to see the atheist billboards being used in various places across the nation in 2012. 1. This one mocks Noah’s Flood (with a ridiculous statement and false assumptions about the height of the mountains before the Flood and about where the water came from). 2. This one totally misrepresents the Bible’s teaching about masters and slaves (servants). 3. This one shows it is the atheists who want to indoctrinate children. Actually, the fact that the secularists are so upset about our national ad campaign for the museum tells us these billboards are effective. And just like everything else we do at the Creation Museum, they are done professionally—first class! In fact, our billboards have won awards in the past. See this previous blog post. Previous Article An Eight Year Old Read What? Next Article Are They Really Trying to Remove Evolution?